Painter 8 make it automatically. *.stk: is strokeview for Variant list of Brush Selector etc. For MacOS X can not read Japanese folder file name, bybug of Runtime Revolution. Please use for MacOS on Classic Environment for delete Painter8J files. 1. Run by Double Click. 2. 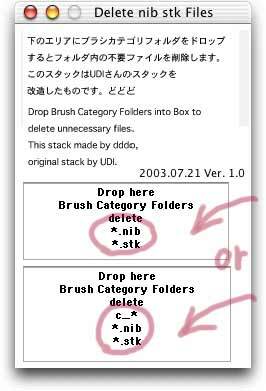 Drop Brush Category Folders into upper or lower Box on lower partof window. Upper Box: Delete only *.nib, *.stk (end of file nameis: .nib, .stk). (end of file name is: .nib, .stk, and head of file name is: c_). No problem: drop *.jpg (Brush Category Icon) files with folders. For fail proof, no action on drop Brush Library folder (like'Brushes'). 3. Close by Click Close Box. This Application made by dddo from UDI's stack. 2003.07.21 Ver. 1.0 for MacOS X, MacOS, and Windows.